Looking for scent-free products can be a pain the behind, but it’s a necessity for me. These products aren’t always available locally, so I’ve turned to the Internet. Here are some of the products I intend on trying out, as well as some I already use. Have you tried any of these? If so, please let me know what you think. This product’s claim to fame is a totally “natural” formula that isn’t harmful if ingested. Reviews are mixed, but since all I need it for is sanitizing the bathroom, I’m willing to give it a shot. Have you used this product? Do you recommend it? I can’t find scent-free glass cleaner anywhere in town. I know about the vinegar, water and newspaper trick, but I don’t buy newspapers, and “ain’t nobody got time for that.” I have seen Seventh Generation products at Loblaws, but I almost never go there, and I don’t recall seeing the glass cleaner. I may just have to give this one a try. I found this product at Costco a long time ago. I use it to scrub my stove and oven as well as my bathtub, and it works really well. I don’t notice any scent either, which is great. I also use it for my counter tops when there’s any gunk on them. I think it’s an excellent all-purpose cleaner. I’m not big on beauty products, and I’m even less interested in brand names, but this is one product I’ll happily recommend. I love my curls, but I could do without all the frizz. Finding unscented hair products is next to impossible. I saw this particular product at Loblaws one day and decided to give it a try. There’s not much of a smell that I could detect, and it works really well for my curly hair. My curls look defined and bouncy rather than just messy. I only use a tiny little bit, scrunch up my hair, and voilá! Great looking curls. When I had my short spiky hair, I used Got2B’s Spiking Glue . It worked really well for short hair and also didn’t have much of a scent. Now that my hair is long, Strictly Curls works like a charm. I personally don’t really use hairspray; however, I am going to have a need for it shortly. I’m going to be in a play again, which is really exciting. I even get my own song this time! Well, yesterday, the director told me that in one of the scenes my hair is going to be crazy wild and really huge. That both made me laugh and also terrified me a little: big hair means hairspray. Hairspray, more often than not, means strong scents. Strong scents means an asthma attack. An asthma attack means I cannot speak properly, let alone sing. So I’m on the lookout for a scent-free hairspray I can bring to the play’s hair stylist. I found this one, which has some good reviews. I’m going to give it a shot. If you’ve used it, please do let me know what you think. In addition to asthma, I also have eczema and extremely dry skin. In the winter, I have to make sure to moisturize at least twice a day. My feet, I have to do as often as I can, as my heels dry and crack pretty easily. I’ve been using Aveeno for years and it’s one of the few lotions I wont’ react to. Having said that, I always buy the fragrance-free version, because even Aveeno’s scented one is too much for my sensitive nose. 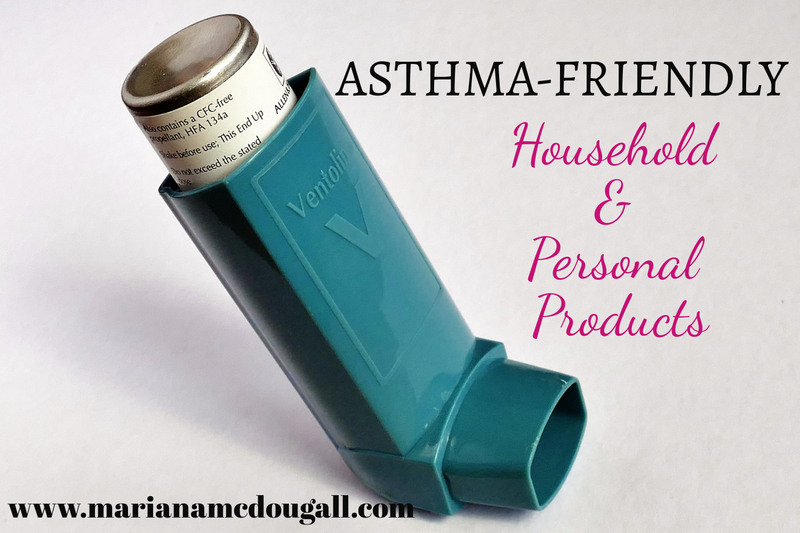 These are some of the products that I use to keep eczema rashes and asthma attacks at bay. Still working on the post nasal drip, but daily sinus rinse is starting to make a difference. I also have a prescription nose spray for that. Time will tell if either solution works long-term. I want to make a note about “natural” cleaning and beauty products. Many of these contain perfumes or very strong “essential oil” scents. Just because the product is “natural” does not mean that a person who is sensitive to scents will not react to them. Just because something is “natural” doesn’t mean it’s not an allergen. Grass and ragweed are natural, yet they are some of the most common seasonal allergens. Looking for “natural” products doesn’t always help me or other allergy-prone people. And “natural” doesn’t really mean anything anyway. The most natural route to go would be to use vinegar, baking soda and water only in cleaning, but I’ve found these products don’t always clean well, and making your own products is often time-consuming. Do you have allergies? What products do you use and feel comfortable recommending?